At the tender age of 8 weeks, little Buddy experienced the worst of human-kind, and fortunately, also the best. During a robbery investigation at a Wilmington home, police found a tiny puppy hanging over a door; a rope was tied to his front leg. Someone must have thought this was fun to do - to torture a defenseless puppy. Thankfully, a compassionate police officer rescued the puppy and called the Delaware SPCA. After a veterinary examination, it was determined that Buddy's leg was not broken, but he had suffered significant nerve damage and could not walk on the leg. He was fitted for a splint and went to see Dr. Kenneth De Groot of De Groot Chiropractic in North Wilmington. 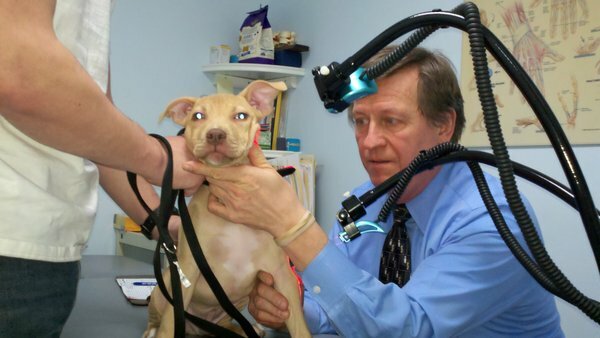 Dr. DeGroot treated Buddy at no charge and used laser therapy to stimulate the nerves - it worked wonders for our little pup! After two months of therapy, Buddy was almost as good as new, running, playing, and enjoying life in a foster home. And the happy ending of the story is that the police officer who found Buddy decided to adopt him. We are happy to say that Buddy (now known as "Crixus") is in a loving home, where he will never be scared or lonely again. Your donatiions make happy endings like this one possible. Please donate to the ASPCA to help protect animals, like Buddy, from abuse and neglect.